What I Read On My Summer Vacation – my books. my life. Reading was pretty hit or miss on my trip. I either didn’t read at all for days or I read a book start to finish. The first week I hardly read at all. The second week of the trip, I finished 5 books (we were on the train a lot). The third week I went back to not reading. But in the end, I think I read more than I would have at home. Probably because I stuck some easy YA in there (shh…don’t tell). I finished seven books. And now I need to review them. Any opinion on what I should review first? BTW, anyone who continues to speak against ereaders has clearly not been on a long trip. My iPad was AMAZING. I read all of these on it and I had so many choices while I was there. I couldn’t imagine lugging actual books around. I’m interested in Domestic Violets since I am on the tour for it in August. That’s the only reason I’d get an iPad. For long trips. I don’t take any long trips right now so I don’t see a benefit to me. I can’t wait to hear what you thought about all of them. Oh you won’t hear a negative word out of me! I am all about the Kindle when I travel. I read a ton of book over the three weeks I was gone, two of them near 600 pages long. And all neatly stored in my cute purple leather-covered device. 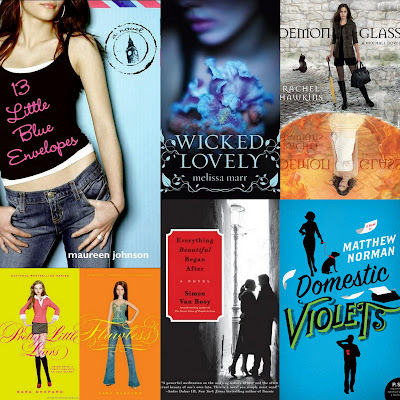 I’ve heard alot of great things about Wicked Lovely, and my daughter loves the Pretty Little Liars series. Please let me know if I am allowing her to ruin herself. I don’t think PLL will ruin your daughter but I’m not in love with the books. I DO love the tv show though. I would love to see a review on Domestic Violets, as I am reading it for a tour very soon. It does seem like you got a lot read over your vacation, which is something that I can never seem to do. I always pack multiple books, bu never get a single one read. Kudos to you! Domestic Violets might be awhile – I like to get them closer to release date. And the secret to reading on vacations is apparently to book LOTS of trains. I would love to hear your thoughts on DEMONGLASS, since you appear to have a differing opinion than me. I have totally forgotten WICKED LOVELY, so maybe your review can jog my memory! I agree that an e-reader is going to change the way we travel forever. I get to bring mine on my first business trip at the end of July. I’m actually quite excited about it but know I’ll have to bring one book with me for the electronic blackouts during takeoffs and landings. I can definitely see the plusses to having an e-reader while traveling. I would probably invest in one if I traveled more often. I haven’t watched the PLL tv show, but the books are addicting. I’ve only read the first 3, I think, and have had to hold myself back from bingeing on the rest of the series.